Aadi 18/ Aadi Perukku is a festival observed on the 18th day in Tamil month Aadi. It is also known as Pathinettam perukku or aadi perukku in Tamil. This year 2018, it falls on August 3rd. Aadi perukku is a unique South Indian festival that marks the beginning of Tamil festivals in Tamil nadu. It is observed on the 18th day of Tamil month Aadi. 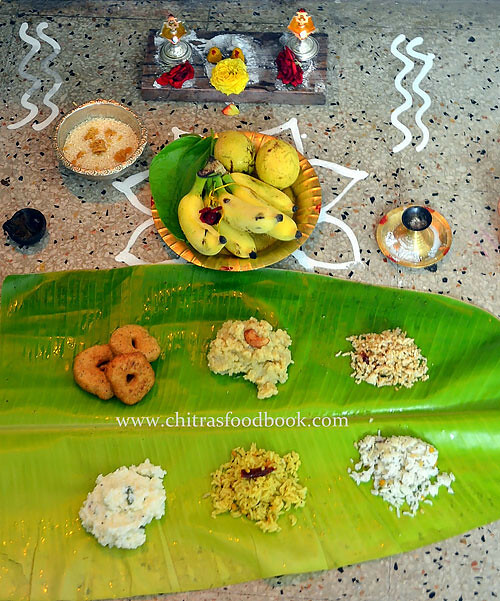 In this post, I have shared the significance of Aadi 18, What to do on Aadi 18, its rituals, how to perform aadi pooja and how to celebrate this festival at home along with the list of Aadi 18 recipes lunch menu / Neivedyam recipes links and our celebration pictures in detail for your reference. Last year I shared the celebration procedures for most of the important Hindu festivals to help beginners and to keep a record for my future reference. But I couldn’t make a post about our first festival, Aadi perukku celebration in a detailed manner. So this year I wanted to share it with my last year’s celebration pictures. Please go through them and have a happy aadi 18 celebration. Hope beginners would find this post useful. Wish you all a very happy Aadi 18 !! Aadi 18/ Perukku is a festival observed on the 18th day in Tamil month Aadi. It is also known as Pathinettam perukku or aadi perukku. In Tamil, ‘perukku’ means ‘rising'. The rising here indicates the overflowing of Kaveri river due to the monsoon rains. It is celebrated near river basins, water tanks, lakes and wells of Tamil Nadu. Devotees take bath in the river & worship mother cauvery in the form of Amman. I have heard about the grand Aadi 18 celebration in Kooduthurai, Bhavani. This festival is celebrated by farmers and people who depend on the rivers and monsoon rains for their life. Special prayers and puja are done in temples. People pray to River Cauvery and Rain God Varuna Bhagavan for a good harvest, constant supply of water and hassle free monsoon. Some regions in Tamilnadu have the tradition of inviting the newly married couple to home and son-in-law is given gifts on the day. Some people also have the practice of adding a gold coin in the thali of bride. During Aadi month, the newly wed girl spends the month at her parent’s home for some scientific reasons. Ingredients for making Rice varieties like Ellu sadam, Tamarind rice, Sweet Pongal, Curd rice, coconut rice & Sundal. Check out my in-laws blog “Learn Kolam” for kolam ideas. Usually Aadi 18 is celebrated in River banks or near water bodies.So my MIL celebrates this festival near water tank in Salem house by drawing a square shaped box with sand( We call it as “Manal veedu”). Make small Pillayar with sand, keep all the Pooja items in front of Pillayar and do the neivedyam. Refer the picture shared below from my in-laws blog "Learn Kolam". Then she drops the flowers, lemon, turmeric into the water tank.But I celebrate in my apartment in a simple manner as suggested by my MIL. The previous day to the festival, wash all the lamps. Keep turmeric, Kumkum dots, put oil, threads /wicks and keep the lamps ready. Clean the house. Wipe the doors, windows clean and keep turmeric, kumkum dots. Prepare Pulikachal/Puliogare paste, Ellu podi, coconut rice mix for making variety rice the next day. Draw Rangoli/Kolam at night. Draw with rice flour paste/ Arisi Maakolam or rangoli powder/Kolam maavu. Check out my in-laws blog “Learn Kolam” for kolam ideas. The next day early morning around 5 am, take bath and get things ready for doing pooja. We should do the neivedyam before 6am or at least before 7am. You can also do in the auspicious time in morning as per the calender ( Nalla neram) or panchangam. Decorate the pooja room with flowers. For morning pooja, make 2 manjal pillayar( One as Lord Ganesh and other one as Amman) and place it in a wooden plank, light two lamps on the sides. Keep this setup in front or inside your pooja room.To make manjal pillayar, take 1 tbsp of turmeric powder, add little water and make 2 small cones. Keep a kumkum dot. In front of the manjal pillayar, place coconut, betel leaves, betel nuts, all fruits, flowers, Yellow rope in a plate or banana leaf. 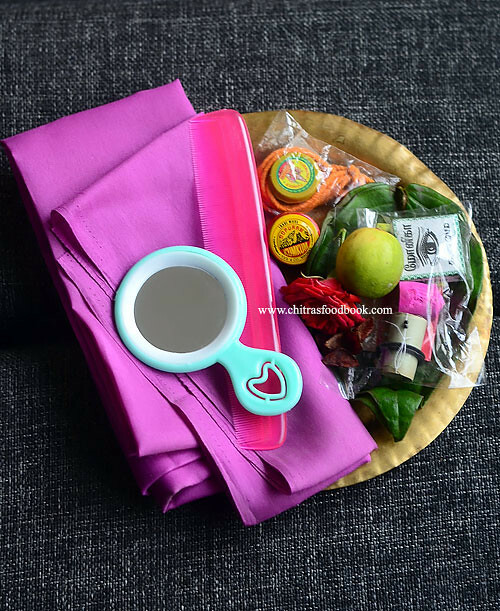 In another plate, keep turmeric, kumkum, sandal powder or tablet, one mirror, bangles, one lemon, your gold jewelries, one new blouse bit, a new dress ( saree or any girls dress) if you have in hand, Katholai karugamani( small black bangles, available in pooja stores). In a bowl/Sombu, fill water till its brim ( Its considered as Kaveri water) & keep it. In a small bowl, mix raw rice and jaggery. This is for neivedyam. Light lamps and do the pooja by showing Dhoop, dheep and mangala harathi. After doing the pooja, tie the yellow rope around your neck by yourself. Tie the rope in hands for small girls at home. Take the manjal pillayar, mix with some water, put the katholai karugamani, lemon, flowers and pour everything in a plant pot or tree. After sometime, take the lemon after sometime & use it in your cooking. 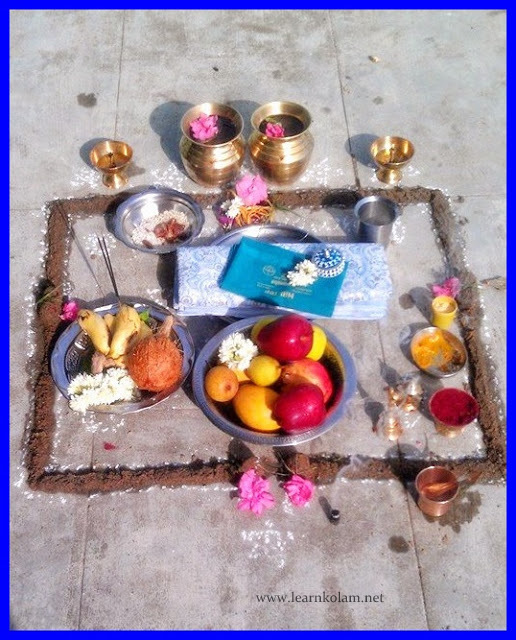 This is our morning pooja. In the afternoon, in an auspicious time ( avoid rahu kalam & Yama gandam), do the pooja with 5 rice varieties and pepper vada/Milagu vadai. I make chana sundal too. Every year I prepare Lemon rice, tamarind rice, Coconut rice, sweet pongal & curd rice. Sometimes we make payasam with jaggery instead of sweet pongal and make Ellu sadam or milagu jeeraga sadam to make a count of 5. My mom used to say we have to make 18 rice dishes for aadi 18 ;) I don’t know how far it is true & is it possible to make 18 rice varieties? I have shared the links of all variety rice recipes , sweet pongal & payasam recipes & vadai ( two versions) below. Please check it. 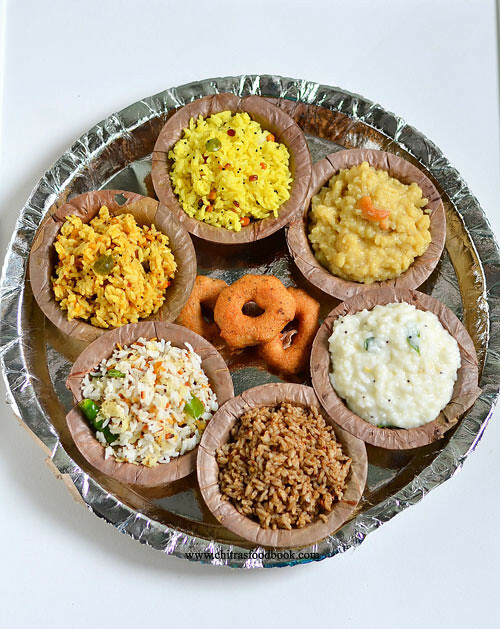 Making this aadi 18 lunch menu is very easy if you have prepared Pulikachal paste, ellu podi, lemon rice paste on the previous day. You can also grind the vada batter and refrigerate it till use. 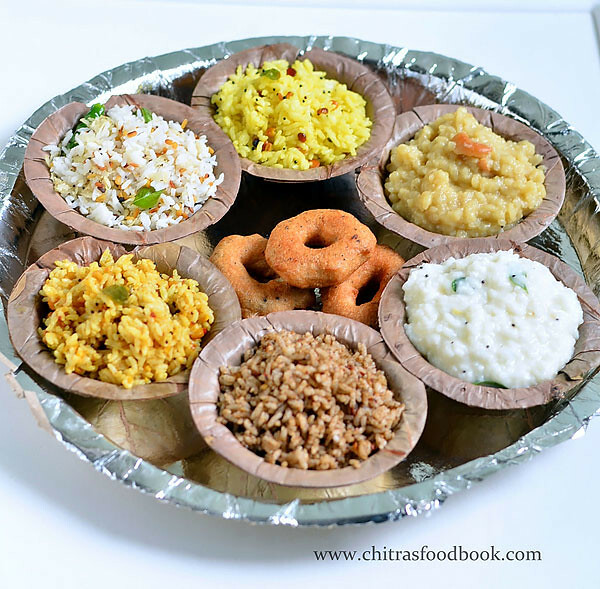 Please refer the video given below on how to prepare 5 rice varieties for Aadi 18 easily. Please visit THIS PAGE for more aadi recipes. 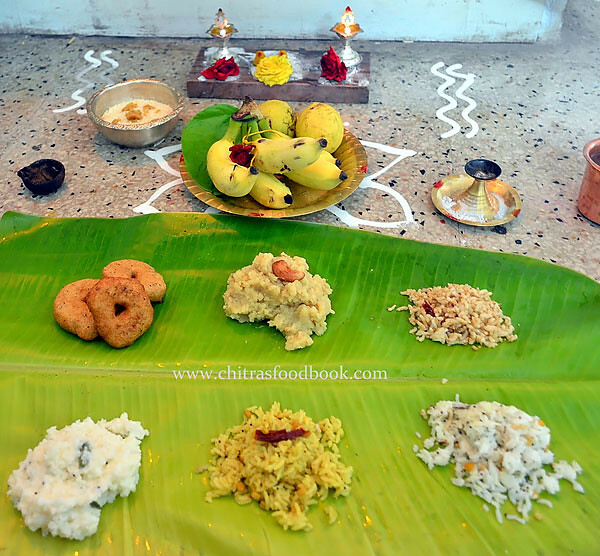 Try these recipes and have a great Aadi 18 celebration ! !